Today’s Friday sermon was based on accounts of the Promised Messiah (on whom be peace) and some traditions related by him which were later described by Hazrat Musleh Maud (may Allah be pleased with him). Each account or tradition carried advice and counsel. Hazrat Musleh Maud (may Allah be pleased with him) said that he had heard the following tradition from the Promised Messiah (on whom be peace). A king’s courtier became a follower of a person who was renowned as a holy man. He started raising the profile of the holy man saying how pious and devout he was and even asked the king to seek an audience with him. The king agreed and the courtier immediately informed the holy person about the details of the king’s visit and asked him to speak to the king in a very convincing manner which would lead him to also become a follower. Whether he was a holy person or not but the story goes on to show that he was definitely foolish. He thought of some things to say to the king and when the meeting took place, he said, your majesty, you should do justice. Look what a fair and just king was Sikander/Alexander [The Great] from among Muslims that he is popular to this day. Indeed, the era of Alexander the Great was centuries before the Holy Prophet (peace and blessings of Allah be on him), even centuries before Hazrat Isa (on whom be peace) but the holy person had called him a Muslim king. This implied that Alexander came centuries after the Holy Prophet (peace and blessings of Allah be on him) because he could not have been around the time of the first four Khilafats because during their times they were the rulers. He could not have been around the time of Hazrat Muawiya because he was the ruler of the entire world during his time. 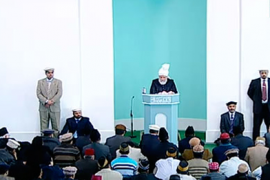 He could not been around the early Abbasiyyad Khilafat because they ruled the world during their time. Thus, if Alexander was a Muslim king he could only have been a king in 4th or 5th century of the Muslim Calendar. Indeed his time was centuries before the Holy Prophet (peace and blessings of Allah be on him) but the person said that he was from among the Ummah of the Holy Prophet (peace and blessings of Allah be on him). As a result the king was greatly put off and immediately left. Of course one does not have to be a historian to be a holy person, but why did the man have to meddle with history? It is important to have correct knowledge and one should only say something that one is sure about. Vested interest caused the man’s ruin and this is what happens when one puts on the cloak of self-styled holiness! Hazrat Musleh Maud (may Allah be pleased with him) said people are quick to pray against others whereas our principle should be to pray for people and not against them. Hazrat Maulawi Abdul Karim related that he lived upstairs at the residence of the Promised Messiah (on whom be peace). One night he heard the sound as if a woman was in the throes of childbirth. When he listened closely he realised it was the Promised Messiah (on whom be peace) engaged in impassioned prayer saying, O God, people are dying of the plague! O God, if they all die who would believe in You! The plague was foretold by the Holy Prophet (peace and blessings of Allah be on him) and was a sign of the truthfulness of the Promised Messiah (on whom be peace). And here he was making impassioned entreaty before God about it. True believer should not pray against general public because he is raised to save them. If he prays against them, who would he save! Indeed, Ahmadiyyat was established for the very purpose of saving Islam and Muslims. Today Ahmadiyyat wishes to restore the glory of the Umayyad period. We have been raised to take Muslims to the high status, how could we pray against them. Hazrat Musleh Maud (may Allah be pleased with him) quoted a poetic couplet of Rumi which says that whatever tribulation God may have put a body of people through, underneath it He has placed a huge treasure. Reading these verses the Promised Messiah (on whom be peace) said if a body of people was to become Muslim in the real sense all trials and tribulations become a source of progress for them. There is ease behind each hardship. At this time true Muslims from among the Ummah are those who are connected to the true and ardent devotee of the Holy Prophet (peace and blessings of Allah be on him). Difficulties we face today will herald ease in the future. Our history bears witness that is what has always been the case and tribulations we face always herald and facilitate progress. A Sikh student had a very sincere and faithful connection with the Promised Messiah (on whom be peace). He sent a message to the Promised Messiah (on whim be peace) that although he used to believe in the existence of God, he was developing some doubts. The Promised Messiah sent him a message in response asking him to change where he sat in college. The student did this and sent a message that his doubts were gone. The Promised Messiah (on whom be peace) explained that the student was under the influence of an atheist. Once he changed where he sat the influence was gone. Whether or not a person says something, good and bad both have their influence on others around. Our youngsters should particularly be mindful who their friends are and who they mingle with, lest they are the cause of any bad influence. Adults may stop children from watching certain TV programmes which could have adverse moral effect or which are not certified for viewing of children of certain age but if the parents watch them, it is possible children would sometime or the other catch glimpse of it as well. In addition such things leave a subliminal effect on the environment and on the parents. It is not as if these programmes help enhance standards of righteousness. It is incumbent on parents to keep their home environment pure so that there is no subliminal effect on children. Hazrat Musleh Maud (may Allah be pleased with him) said that the Promised Messiah (on whom be peace) would say to some people that one needs to have a connection with whoever one asks to pray on one’s behalf. And he would ask them to make an offering and then assure them that he would pray. He related a tradition many times. Someone went to a holy person and asked him to pray for him because he had lost the ownership documents of his house. The holy person asked him to first bring some halwa (sweet confection). The man was astonished but he was in need of prayer so off he went to purchase some halwa. Just as the shopkeeper was about to wrap halwa in paper the man cried out, do not tear up the paper please! These are my papers (house documents). He took the halwa to the holy person and told him he had found his papers. The holy person replied that his intent behind asking for halwa was only to forge a connection and for him to pray on his behalf but it had benefitted him in other ways as well. There are many accounts with reference to the Promised Messiah (on whom be peace) where he made special compassionate prayer for people’s health and their businesses. These were people who gave generously to the mission and had developed a special connection with the Promised Messiah (on whom be peace). The Promised Messiah (on whom be peace) used to relate a tradition about two Companions. A Companion brought a horse to sell in the marketplace and another Companion asked him the price of the horse. He told him the price but the other said no, this is not the price of the horse. And he gave another price which was more than the asking price. The seller said he would only take the price that he had given while the potential buyer said he would pay the price he thought was right. This is a relatively small account of the honesty and veracity of the Companions. They used to vie with each other in all good things. Indeed, God states vie with each other in everything good. If someone serves faith we should try and do better than them and in the process sacrifice our selfishness. If each one of us, rather than vie in worldly matters, vies in serving faith and tries and excel others in honesty, not only will it benefit us on a personal level, it will also be good for our children and the Jama’at will also progress. An important matter that every Ahmadi should focus on is that God alone is the Master of all attributes and from Him alone comes guidance. Our task is only to take the message to others which we should perform to the best of our abilities. However, the result is only in God’s hand and comes from Him. We should not imagine that if such and such becomes an Ahmadi the Jama’at would progress. Hazrat Musleh Maud (may Allah be pleased with him) said that some people would come to see the Promised Messiah (on whom be peace) and say if such and such in our village becomes Ahmadi, we other villagers would also follow suit. This is not the correct attitude. Even if such a person did accept Ahmadiyyat there would be many others who would not and would not desist from denying the Promised Messiah. There were three maulawis in a village and the village people said if any one of these accepted Mirza Sahib we would also accept him. One of the three maulawis accepted Ahmadiyyat and took bai’at but the villagers said so what if just one of them has accepted? He has lost his senses. Later, the second maulawi accepted Ahmadiyyat and took bai’at but the villagers said they were both foolish and maintained that one maulawi had still not accepted and neither did they. This attitude still takes place and those with limited experience imagine that if such and such accepts everyone will follow suit. Our trust and reliance should only be on God. However, people rely on people. At times people write in saying such and such person has made these provisos, pray that he accepts Ahmadiyyat. If he does our area will have a revolutionary transformation. Of course we should be praying that people who excel in sincerity and loyalty come in the Jama’at. Hazrat Musleh Maud (may Allah be pleased with him) said that a woman of low social status came to the Promised Messiah (on whom be peace) pleading that her son had become a Christian. She asked for prayers for him to revert to Islam. The Promised Messiah (on whom be peace) asked her to send the boy to see him so that he would listen to discourses about God. The boy was unwell with tuberculosis and was being treated by Hazrat Maulana Nur ud Din (may Allah be pleased with him). The Promised Messiah (on whom be peace) continued to counsel him but Christianity had been embedded in him. Listening to the Promised Messiah’s discourses he felt he may revert to Islam, so one night when his mother’s attention was diverted he ran off to Batala Christian mission. The mother followed him on foot and brought him back. She would desperately plead the Promised Messiah that her son was not as dear to her as Islam was. He was her only son and she told the Promised Messiah (on whom be peace) that her desire was for him to revert to Islam even if he were to then die. Her son became a Muslim and died after a few days. The woman knew that if there was any ultimate human means to bring him back to Islam it was through the Promised Messiah (on whom be peace) for he alone had true compassion and pain for Islam. Once a man of limited means came to visit the Promised Messiah (on whom be peace). He told the Promised Messiah how he had been able to travel by train, perhaps by obtaining his ticket by means which were not right. The Promised Messiah (on whom be peace) gave him one rupee, a lot of money in those days and said I hope you will not need to resort to those means on your return journey. Hazrat Musleh Maud (may Allah be pleased with him) said he remembers a boy named Fajja used to be an attendant of the Promised Messiah whom he put into apprenticeship of a builder and he ended up learning the trade. Fajja had learning difficulties but he was sincere and religious. Once some guests came to see the Promised Messiah (on whom be peace). These were early days when there was no Langar established and guests were served by the household of the Promised Messiah (on whom be peace). On arrival of the guests, who were five in number, the Promised Messiah had some tea made and instructed Fajja not to miss serving any of the five guests. Another attendant by the name of Chiragh accompanied Fajja to serve tea. Meanwhile the guests went to see Hazrat Mualana Nur ud Din (may Allah be pleased with him). The two attendants took tea to where the guests were. Chiragh was an old attendant and owing to the status of Hazrat Maulana Nur ud Din he served him first. But Fajja held his hand saying the Promised Messiah had not named him as one of the guests. Chiragh signalled with his eyes and nudged him and tried to make him understand that even if his name was given he was the most honourable among them and had to be served first all but Fajja kept saying the Promised Messiah (on whom be peace) had only name five people who were to be served tea. Thus were his learning difficulties that he could not even understand the situation. However, he soon picked up building skills when placed in apprenticeship of a builder. Thus Hazrat Musleh Maud (may Allah be pleased with him) draws attention of people who do not do anything and waste time that anyone can learn a skill and make a living. The Promised Messiah (on whom be peace) was displeased with a person for some twenty years who later on became a most sincere Ahmadi. This was because when the Promised Messiah (on whom be peace) went with his brother to pay condolence at the death of his son the person embraced everyone who came for condolences sobbing and screaming and he did just that with the brother of Promised Messiah saying that God had (God forbid) been very cruel to him. This greatly put off the Promised Messiah (on whom be peace) and he did not even wish to see his face. Later God guided the person and he abandoned ignorant ways. Hazrat Musleh Maud (may Allah be pleased with him) said that the Promised Messiah (on whom be peace) used to relate that during his student years Hazrat Mir Muhammad Ismael Sahib had an atheist in his class. One day an earthquake struck and the atheist involuntarily uttered ‘Ram Ram’. He must be of Hindu background. Mir Sahib asked him why he uttered Ram Ram as he did not believe in God. The boy said he had made a mistake. Hazrat Musleh Maud (may Allah be pleased with him) explained that people become atheists based on ignorance whereas people believe in God based on knowledge. This is what at time of death and when afraid atheists think it is likely that they are in the wrong. Otherwise they would say at time of death, give up the superstition of God, whereas what is experienced is to the contrary. This is a tremendous argument for the existence of God. Once the Promised Messiah (on whom be peace) made a private note in a private notebook. It was very personal, as if a whisper to God, written not for anyone to read or see. It was published by Hazrat Musleh Maud (may Allah be pleased with him) because God put it in his heart to do so. The gist of what the note said is: O God, how could I ever leave You for You assure me and help me at times when no friend and confidant can help me in any way. The Promised Messiah (on whom be peace) advised on numerous occasions that every Ahmadi should have very high morals. His own model in this regard was such that once the wife of one of his bitterest Hindu enemies fell gravely ill. Musk was one of the ingredients of the remedy the physician prescribed which the Hindu could not find anywhere. He came to the Promised Messiah (on whom be peace) very sheepishly and asked if he had any musk to spare. He only needed a tiny amount of musk but he himself related that the Promised Messiah (on whom be peace) gave him an entire bottle-full and said his wife was very ill he should take it all. Hazrat Musleh Maud (may Allah be pleased with him) said that the Promised Messiah (on whom be peace) used to say that the root word of ‘taoon’ [Persian/Urdu word for plague) is ‘taan’ which means to pierce with a spear. Thus, the same God Who had shown a forceful demonstration to the enemies of Jesus lives today, and will certainly demonstrate His power again and will never stay silent. However, we will remain silent and will advise the Jama’at to control their emotions and show the world that there is a Jama’at in the world which stays peaceable in the face of all manner of provocation. The Promised Messiah (on whom be peace) advised that if anyone cannot experience true humility and meekness when praying they should pretend to feel humility and this will lead them to feel sincere humility and tenderness. The Promised Messiah (on whom be peace) said: Our failure in certain matters and to be surrounded by enemies is only because a section of us is indolent about prayer and there are many who do not know how to pray and who do not even know what payer is. Prayer is the name of accepting death. Asking someone for something is a death and man cannot ask without assuming death. Prayer means man assumes a kind of death upon himself because a person who knows he can do something on his own does not call on anyone for help! Man requests help when he knows he cannot do something on his own. Similarly only he can ask God who considers himself dead and without any support before God. God states that unless man assumes a kind of death in God’s way his prayer will not be true prayer. May God enable us to adopt sincerity and high morals and high standards of worship of God and may He also enable us to make prayers which are accepted and may we also pay the dues of prayer.